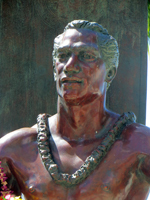 Duke Kahanamoku Statue Honors Hawaii’s Renowned Swimmer, Surfer and Sheriff. 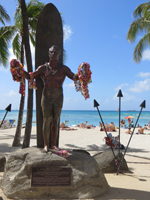 Duke Kahanamoku Statue Honors a True Hawaiian Legend! The Duke Kahanamoku statue is exactly that – a statue. It’s not really Waikiki entertainment or a Hawaii activity. It’s just something to see; and it happens to be very close to several other things you might want to do and/or see – such as Waikiki Beach, wizard stones, and more! 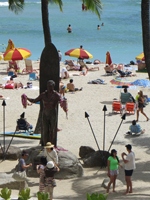 Nevertheless, the Duke Kahanamoku statue is a true Hawaii attraction in its own right. Without repeating everything that you can read for yourself on the bronze plaque at his feet, I will tell you that Duke was probably the most famous Hawaiian of the twentieth century! In addition to being the fastest swimmer in the world, he was almost single-handedly responsible for introducing the sport of surfing to the world! Duke and his surfboard became famous for the daring rescue of several capsized sailors, worldwide exhibitions, and numerous film appearances. In the early 1900’s, before the Waikiki shoreline was altered into its current configuration, an extraordinarily large south swell used to occasionally run parallel to the coast (instead of waves rolling in perpendicular toward the beach as is commonly seen now). During one such swell, Duke Kahanamoku was credited with the longest wave ever ridden, when he rode 1.5 miles from Diamond Head crater to Honolulu Harbor! As a result of these feats and more, Duke Kahanamoku was the first person to be inducted into both the swimming and surfing halls of fame. The accolades go on and on. I could go on and on! Let’s just say that the guy lived an amazing life and could have been the real-life inspiration for Dos Equis’ most interesting man in the world commercials! If you feel yourself wanting to know more, I don’t blame you. But I’m going to have to suggest that you read a biography. I’d also like to show you some of Duke’s historical photos, but I don’t own the rights to those, so I’ll refer you to the Hawaii Memorabilia at the Moana Surfrider Hotel. 1. Duke: The life story of Hawaii's Duke Kahanamoku by Joseph Brennan – a great read, but lacking pictures. 2. Duke: A Great Hawaiian by Sandra K. Hall – a shorter, touristy book with basic info and nice pictures. 3. Duke's Olympic Feet and Surfer of the Century: The Life of Duke Kahanamoku both by Ellie Crowe – fun stories with beautiful illustrations… both highly recommended for children and adults. I’ll give you just one more interesting fact about the man: even though Duke Kahanamoku was Hawaii’s unofficial ambassador to many of the world’s dignitaries at the time, Duke was not a royal title – it was his name. He was named after his father, who had been christened by Bernice Pauahi Bishop in honor of the Duke of Edinburgh, Prince Alfred. There’s hardly a moment of any day when somebody’s not posing for a picture in front of the Duke Kahanamoku statue! First of all, it’s in a great location – right at the sandy edge of Waikiki Beach! Second, even in death, Duke Kahanamoku continues to be the ambassador of aloha welcoming all to Hawaii through his statue’s outstretched arms and friendly appearance. And finally, it’s just really cool to take a picture with surfing’s greatest hero! 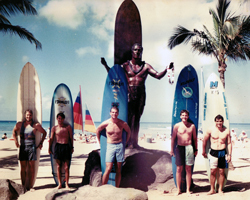 One note about the Duke Kahanamoku statue itself… I keep forgetting to check if it’s still there or not, but there used to be a small title plaque on the side of the surfboard that said something like: Duke Kahanamoku and surfboard (actual size). Just in case you see that and find yourself wondering… Duke was not nine feet tall! Only the surfboard is actual size. One of Duke’s favorite surfboards was a 16-foot slab of koa wood weighing 114 pounds! I won’t go as far as to say that your Hawaii vacation is incomplete without a family portrait posing in front of the Duke Kahanamoku statue. It’s not a Hawaii activity to plan your whole trip around. But if you’re going to be in Waikiki anyway… some Santa hat stock art and just a little Photoshop magic could make yours the warmest winter photo card among all your friends! Just a thought.